We've lived through a four-year stretch unlike any other in the past 120 years. Let's get T-shirts made. With nearly 48 inches of rain in 2017, Seattle has experienced the wettest four-year stretch in the city’s recorded history. Seattle typically gets about 37.5 inches of rain each year, but for four years in a row the city has recorded more than 44 inches, according to National Weather Service data. That is the first time in more than 120 years of weather records. Remarkably, the soaring rain total for 2017 came despite the city’s recording the hottest and driest summer on record, with barely half an inch of rain during that three-month stretch. You may recall the persistent wet that was last year’s winter, but at times this past year’s rain came in deluges. In mid-January, nearly three inches of rain in two days also brought chaos in the form of freezing rain and snow in the mountains. February started with a steady five inches of rain in six days, helping set some new records. Then, in mid-October, a stream of storms that opened Seattle’s rainy season dropped more than four inches in four days. Seattle’s four-year total of 186.4 inches is higher than the previous four-year high of 180.6 inches recorded from 1995 to 1998, according to weather-service data. The new year is looking to start off dry, with clear weather through Wednesday and maybe Thursday before a better chance of rain arrives on Friday. But the weather service is predicting above-average precipitation for the winter months due to La Niña conditions, in which cooler waters in the tropical Pacific Ocean signal the potential of colder and wetter weather for the Pacific Northwest. 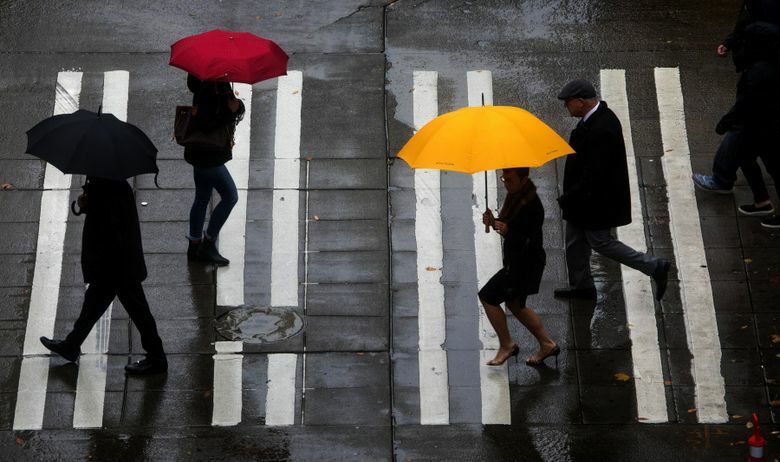 While Seattle’s rainfall can bring a persistent dreariness – dubbed “The Big Dark” by the National Weather Service in Seattle – the precipitation total from 2017 falls well short of other cities around the country. Hurricane Harvey dumped about as much in parts of Texas during that disastrous storm alone. Miami recorded more than 80 inches of rain for the year, according to weather-service data. And out on the Olympic Peninsula, where lush rainforests flourish, records show Forks received about 120 inches of rain in 2017. That’s about average.